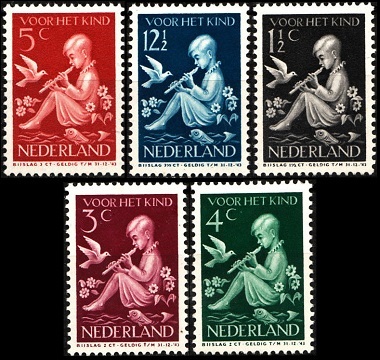 Surtaxed Netherlands stamps issued during the period from 1937 through 1939 continued the contemporary practice of issuing two sets of stamps each year, one for social and cultural funds during the Summer, and the other for public or child welfare funds during December. The Summer issues usually honored famous Dutchmen, and the December issues usually featured children's themes. 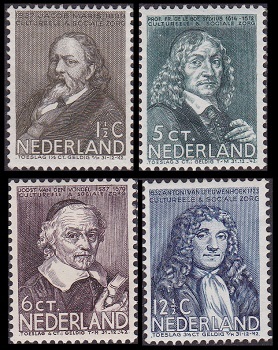 The four surtaxed Netherlands stamps shown above (NVPH #296-99, Sc. #B94-97) were issued on June 1, 1937, with the surtax benefiting social and cultural projects. The 1 1/2 C. + 1 1/2 C. denomination features Jacob Maris (1837-1899), a dutch painter of The Hague School. The 5 C. + 3 C. denomination features Franciscus Sylvius (1614-1672), a Dutch physician and scientist. He was one of the first proponents of the theory of blood circulation in the Netherlands. The 6 C. + 4 C. denomination features Joost van den Vondel (1587-1679), one of the most popular Dutch poets and playwrights of the 17th Century. The 12 1/2 C. + 3 1/2 C. denomination features Antonie van Leeuwenhoek (1632-1723), a Dutch tradesman and scientist. He is known as the "Father of Microbiology", and he is considered the first microbiologist. 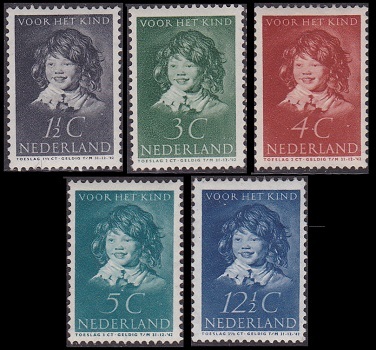 The five surtaxed child welfare Netherlands stamps shown above (NVPH #300-04, Sc. #B98-102) were issued on December 1, 1937. The design of these stamps features "The Laughing Child", from the 1625 panting by Franz Hals (1580-1666). 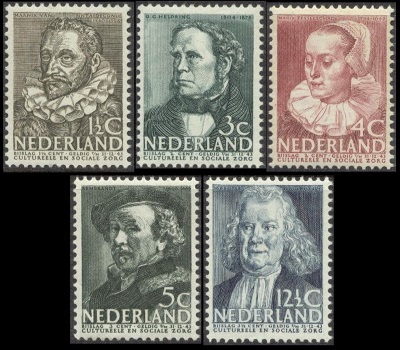 The five surtaxed Netherlands stamps shown above (NVPH #305-09, Sc. #B103-07) were issued on May 16, 1938, with the surtax benefiting social and cultural projects. The 1 1/2 C. + 1 1/2 C. denomination features Marnix van Sint Aldegonde (1540-1598), a Flemish writer and statesman. He is considered to be the probable author of the text of the Dutch National Anthem. The 3 C. + 2 C. denomination features Ottho Gerhard Heldringstraat (1804-1876), a Dutch clergyman and author. The 4 C. + 2 C. denomination features Maria Tesselschade Visscher (1594-1649), a Dutch poet and engraver. The 5 C. + 3 C. denomination features Rembrandt Harmenszoon van Rijn (1606-1669). He is regarded as the greatest Dutch painter of the Baroque Era and the greatest painter of the Dutch Golden Age!! The 12 1/2 C. + 3 1/2 C. denomination features Herman Boerhaave (1668-1738), the noted Dutch botanist, Christian humanist, and physician. 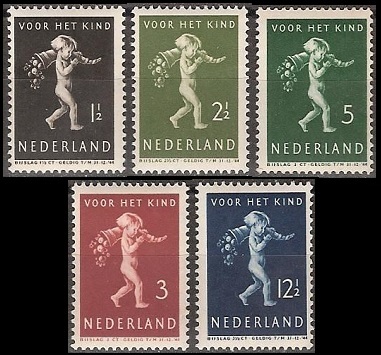 The five surtaxed child welfare Netherlands stamps shown above (NVPH #313-17, Sc. #B108-12) were issued on December 1, 1938. The design of these stamps features a dove, flowers, and a child playing a flute. 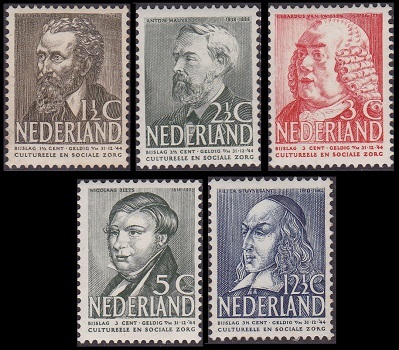 The five surtaxed Netherlands stamps shown above (NVPH #381-22, Sc. #B113-17) were issued on May 1, 1939, with the surtax benefiting social and cultural projects. The 1 1/2 C. + 1 1/2 C. denomination features Matthijas Maris (1839-1917), a dutch painter, etcher, and lithographer. 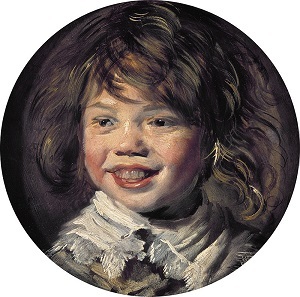 His two brothers, Jacob and Willem, were also artists. The 2 1/2 C. + 2 1/2 C. denomination features Anton Mauve (1838-1888), a Dutch realist painter and a leading member of The Hague School. The 3 C. + 3 C. denomination features Gerard van Swieten (1700-1772), a Dutch-Austrian physician. He was a pupil of Herman Boerhaave (1668-1738), and in 1745, he became the personal physician of the Austrian Empress, Maria Theresa (1717-1780). The 5 C. + 3 C. denomination features Nikolaas Beets (1814-1903), a Dutch theologian, writer, and poet. The 12 1/2 C. + 3 1/2 C. denomination features Peter Stuyvesant (1612-1672), the Director-General of the Dutch colony of New Netherlands from 1647 until 1674. At that time, the North American colony was ceded to Great Britain, after which it was renamed to New York. The five surtaxed child welfare stamps shown above (NVPH #327-31, Sc. #B118-22) were issued on December 1, 1939. The surtax benefited destitute children. The design of these stamps features a child carrying a cornucopia.